Hi everyone! I hope you are all enjoying the last little bit of summer. I FINALLY finished my summer classes Saturday so I'm really enjoying this last week of relaxation. While I'm happy that this stressful summer has come to a close, I'm thankful for all the fun times I had with my family and friends the last few months. Sticking with last post's back to school vibe, I thought I'd make a quick post to tell y'all all about 5 essentials that I always have in my backpack with me to carry to class. These are 5 must-haves that I consistently make sure to pack along with all my books, folders, etc. Hand sanitizer is an absolute must for me to have on campus. While I'm not a huge germaphobe or anything, there's normally thousands of students on campus daily. Think about how many people touched that stair rail or that door- ew. It's nice to have something to make you feel a little bit cleaner. Plus, the ones from Bath and Body Works smell amazing so that's always a plus. Whether you're team iPhone or team Android, it's always a good idea to carry your charger with you in case your phone dies before you get to post that perfect selfie on Snapchat. Just kidding- I bring it mainly for safety reasons. You always want to be sure that your phone stays charged so you have the ability to get help if you need to while walking around campus alone, especially at night. Some days I love wearing my hair down, while others it drives me crazy and all I want to do is put it up. I always like to cary a couple hair ties with me in my backpack in case the latter happens. It's also nice to get my hair up when it's 1919292 degrees, like it so often is in Texas. I always bring a water bottle to campus with me when I'm going to class. Staying hydrated is so important for your health, so I try to finish at least one or two of these while I'm going to class. I love reusable water bottles because they save you money and are better for the environment. Win win! Last but certainly not least, I ALWAYS have some form of lip balm in my backpack. I don't know about y'all, but I can't stand when my lips feel dry or chapped. It's nice to buy a lip balm to keep solely in your backpack just in case you need it. One with SPF is also always a good idea. Well, that's all 5 of my backpack essentials! I hope you enjoyed this quick post, and have some new ideas of things to bring in your backpack onto campus for the upcoming semester! 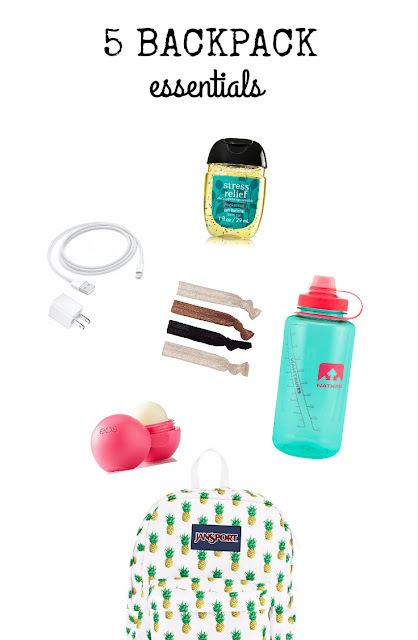 Do you have any essentials that you bring with you to campus? If so, what are they? Let me know in the comments down below!